Wild Wild Country, an Emmy-winning Netflix documentary series, has rightly garnered widespread praise since its release earlier this year. It is refreshingly non-didactic, with a warmth toward its interview subjects that avoids judgement of their actions. It takes what could easily lapse into an exploitative fixation on the bizarre (Cults! Poisoned buffets! Free love!) and steers viewers towards a meditation on some fairly heady concepts. Wild Wild Country’s subject is historically distinct — a clash between a new religious movement and local residents in early 1980s Oregon — but it contains historical resonances that stretch from the colonization of the Americas to present-day battles over gentrification, voting rights, and economic justice. The series chronicles the rise and fall of a new religious movement led by Bhagwan Shree Rajneesh (later “Osho”) and administered by his charismatic, acid-tongued secretary, Ma Anand Sheela. Formed in India in the 1970s, the movement rapidly grows in membership and wealth — attracting the attention of the Indian authorities. Sheela orchestrates a move to the United States and the organization purchases a sixty-four-thousand-acre ranch in rural Wasco County, Oregon, where it attempts to build a city: Rajneeshpuram. This effort quickly thrusts movement adherents (called sannyasins or “Rajneeshees”) into a pitched conflict with the aging conservative residents of the closest town, Antelope. 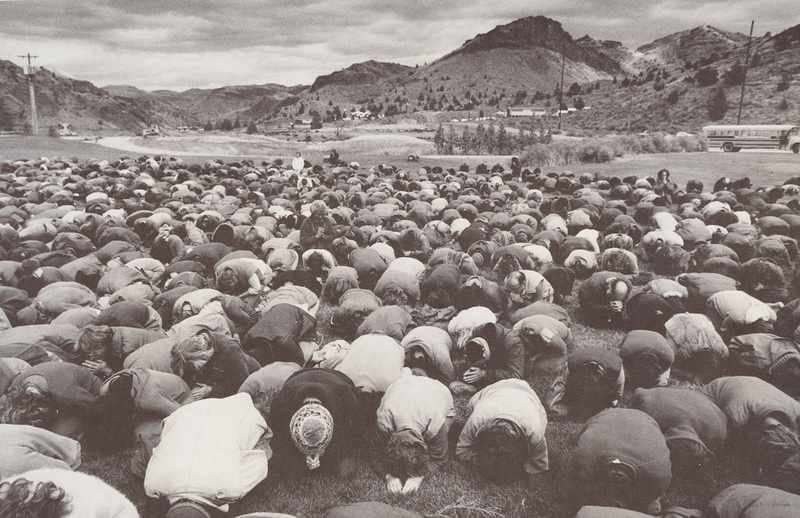 When the residents attempt to stop the incorporation of Rajneeshpuram, the organization doubles down — purchasing property in Antelope, running sannyasins for elected positions, and essentially taking over the city. They then bus in thousands of homeless people to their ranch to influence the county elections. As tensions rise, the situation becomes explosive, resulting in a hotel bombing, mass salmonella poisoning, assassination plots, and attempted murder. Ultimately, the organization splits and the Bhagwan is arrested and forced to leave the country. The Antelopians prevail. The six-episode series, however, is no far-right fantasy of white oppression and rebellion. Wild Wild Country’s detached eye invites a critical engagement with the events depicted, a microcosm of capitalism in the American West. By displaying this history in uncanny form, the series challenges viewers to grapple with its violence and contingency, while offering an ambivalent take on the possibilities for change in a country that touts its commitment to democracy, but is in fact terrified of it. The sheer Americanness of the Rajneeshees’ Wasco County settlement is difficult to overstate. Inspired by visions of the US as a “land of promise,” the Rajneesh movement moves to the rural expanses of central Oregon seeking religious tolerance, economic opportunity, and freedom from a suspicious government. Their plan to found a city makes use of laws with roots in the pioneer history of Oregon, whose 1857 constitution provides for “home rule” charters that give cities a large degree of independence vis-à-vis state and federal governments. And under Oregon’s Incorporation Act of 1893, any 150 residents can vote to incorporate as a town — precisely what the Rajneesh movement hope to do. There is a heroic quality to the sannyasins’ feat, building not just a self-sustaining farm but an entire town out of rugged and unforgiving terrain — bringing life and civilization, they say, to a veritable wasteland. Bhagwan lawyer Swami Prem Niren calls it “turning the desert green,” in words that sound straight out of a triumphalist history of American settlement (or a John Wayne western, one of which was filmed at the future site of Rajneeshpuram). Ironically, the sannyasins’ embrace of classic American tropes evokes sheer terror on the part of the local Oregonians, who otherwise see the pioneer spirit as central to the county’s identity. To them, the settlement process is an “invasion,” the Rajneeshee police an “occupying force.” Antelope mayor Margaret Hill asks, should a group of interlopers be allowed to “literally wipe out” a local culture? The Wasco were party to the 1855 Treaty with the Tribes of Middle Oregon, which was signed in The Dalles — later the site of the infamous Rajneeshee salmonella attack. Under the treaty, the Wasco and others ceded 10 million acres of land to the US government while preserving a 640,000-acre area that became the Warm Springs Indian Reservation. Much like this and other treaties associated with westward expansion, the Rajneeshee takeover of Antelope occurred through processes that were legal — or at least had a veneer of legality. The organization purchased the massive ranch in a straightforward real estate deal and began acquiring homes and other properties in Antelope with its substantial surfeit of cash. What the Rajneesh movement did in Antelope is also just a slight twist on what developers and real estate speculators do every day in cities around the country. Land in the area was dirt cheap, and much of the town was already for sale — there just hadn’t been a motivated, incentivized purchaser. Offered a fair, even generous price for their homes, residents began to leave — and the tenor of the town changed accordingly. The sannyasins renamed the local greasy spoon “Zorba the Buddha” and started serving health food instead of burgers. Not quite an overpriced craft beer bar or artisanal candy store, but the impact was pretty much the same. There was a final parallel: the Antelope residents who remained decried the transition in cultural, rather than political-economic terms — paralleling the misdirected emphasis on hipsters, rather than developers, as the face of gentrification. A fitting response, perhaps, given the inter-class makeup of the anti-Rajneesh coalition, which included affluent ranchers and the founder of Nike. United in opposition to the New Age interlopers, they formed an insurgency of sorts to run the sannyasins out of the state. It would be fair to question whether Wild Wild Country paints the reaction to the Rajneeshee takeover in a positive light, positioning the white conservative residents of Antelope as an oppressed people, besieged by foreign invaders. But the series makes clear that the local Oregonians, who claim to be in favor of democracy and the rule of law, are in fact willing to jettison these ideas the moment they threaten their own privileges. Repeated references to the “evil” and “satanic power” of the sannyasins show that Antelope is not some haven for secular, democratic government but a site of de facto white, Christian rule under momentary contestation. Needless to say, this is hardly a state of affairs unique to rural Oregon. The series suggests that bubbling under the surface of our shining city on the hill is a deep discomfort with mass democracy. One-person-one-vote is celebrated as long as it does not challenge entrenched power structures, local or otherwise. The moment that power is imperiled, democratic pleasantries are thrown out the window in a fit of pure reaction, exposing the farcical — some would say sham — quality of democracy in the United States. Nowhere is this better illustrated than when the Rajneeshees, hoping to import a reliable voting bloc to advance their interests, send emissaries (and buses) to major urban centers to recruit homeless people. Promising them food, shelter, medical care, and a modicum of personal dignity, thousands board the buses to Rajneeshpuram — drastically increasing the voting population of Wasco County. The response from local residents and officials mirrors today’s right-wing panic about so-called “vote fraud,” with feverish calls to increase Oregon’s residency requirements. (William Gary, deputy attorney general for the state during the period in question, warns ominously that Oregon “then and now is in the forefront of easy voting.”) Eventually, officials outright halt voter registration in the county, preventing the recently homeless — who are, it happens, disproportionately people of color — from joining the Wasco electorate. Ma Anand Sheela and her inner circle clearly had self-interested reasons for inviting the homeless to Oregon, and the callousness with which they ultimately treated them (drugging and abandoning them when their effort fails) is reprehensible. But were those who elected to move and exercise their rights not “voting for their interests,” as the phrase goes? The Rajneesh organization offered the homeless what American capitalism had not: a roof over their heads, a life free from street crime, a chance to pursue activities other than mere survival. Sheela’s motives were selfish and her actions exploitative, but her plan correctly recognized the untapped power of those who possess a right to influence the political process, yet are kept from participating in it due to structural inequality. Today there are more than half a million homeless people in the US, and — like the 40 million Americans living in poverty — almost never are they treated as a constituency of voters. Wild, Wild Country raises the question: what would happen if the homeless, the poor, and others left behind by American capitalism suddenly exercised their right to vote in an active and forceful way? What if they were given the chance to vote for politicians and policies that actually placed their interests front and center? What if they were empowered, rather than instrumentalized or pitied? If you happen to be one of the powerful, the mass enfranchisement of the poor is a deeply disturbing image. Wild Wild Country proposes that attempts to fulfill the stated values of American democracy will be met with proof that we live under something else entirely. Toward the end of Wild Wild Country, we are shown a plaque that has been placed in “liberated” Antelope to memorialize the clash of the early 1980s. The short inscription concludes with a cliche quote (you know the one) commonly attributed to Edmund Burke. It is a fitting inclusion, given that Burke was a reactionary critic of the French Revolution and a founder of modern conservative thought. The triumphant Oregonians display nary a hint of critical self-reflection as they look back over the events depicted in the series. They are back on top, the political status quo has been reasserted, and that is all that matters. Rajneeshpuram becomes a Young Life camp. Christian rule has been restored. Wild Wild Country’s condensation of American history implies a clear connection between nineteenth-century settler colonialism, contemporary urban gentrification, and what passes for liberal democratic rule in the United States. The logical conclusion is that less has changed since the conquest of the West than we might think: those who benefited then continue to benefit now. It is a politically charged observation, fitting for a time when indigenous rights are under threat, working-class people are being pushed out of cities, the homeless are treated as criminals, and millions are at risk of being systematically disenfranchised. Wild Wild Country does not offer a political path out of this downward spiral, but we know the obvious one: organize, organize, organize. Now is the time to work.